We read with interest this Straits Times article (http://www.straitstimes.com/breaking-news/singapore/story/tycoon-books-sea-aquarium-rws-sons-2-million-wedding-20130925) that reported that a Malaysian real estate developer tycoon had booked the Southeast Asia Aquarium at Resorts World Sentosa for his son’s wedding. The total damage? Some 2 million dollars, including a generous gift of a 1.2 million dollar Lamborghini to the couple. This also marks the first time the Southeast Asia Aquarium is hosting a wedding on its grounds. 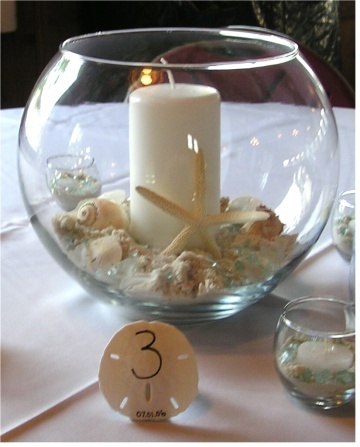 While most of us can hardly afford the lavishness of the above wedding, we can’t help but be inspired that the aquarium seems like a pretty romantic and unique venue for a wedding, especially since it has long served as the choice location in dramas and movies for the lead characters’ romantic endeavours! And with this we’ve rounded up some ideas around the Internet to get your mind into overdrive! The aquarium summons images of the tranquil and mysterious underwater world, and what better colour palette can better materialise this than those reminiscent of the deep sea — blue, purple and aquamarine? Forget cheery, cute shades of lavender and sky blue — instead, opt for deeper shades like violet, navy blue and cobalt to complement the overall dark environment. With the right balance, these colours can give an air of whimsical etherealness to your set-up, as these reference images show. Instead of the usual fresh flowers, why not consider bringing something from your immediate surroundings to your wedding? You have the license to be creative — elements from under the sea at your possible disposal include sand, seashells, and even live fish. We’re sure this will help to create special centrepieces that will definitely brighten up your guests’ tables and create some buzz during your wedding! One of the biggest challenges of holding your wedding at the aquarium is how to make the dim surroundings work in providing visibility for your guests, and equally important, be conducive enough for some decent photo taking during the event. A cheap and simple solution? Put in some fairy lights and tealight candles. Not only are they pretty, to say the least, they also unconditionally contribute to the overall whimsical feel of the decoration, and help bring it one level higher. Of course, the fact that these are easy on the wallet are a big plus point as well.